Check it out: A greener way to travel: the environmental impacts of home sharing by Airbnb. In Europe alone, Airbnb guests use 78 percent less energy than hotel guests – that’s enough energy to power 68,000 homes for one year. With an impact that big, it’s clear that the Airbnb community is making a huge difference. In one year alone, Airbnb guests in Europe saved the equivalent of 1,100 Olympic-sized pools of water while avoiding the greenhouse gas emissions equivalent to 200,000 cars on European roads. Airbnb hosts also tend to engage in sustainable practices. 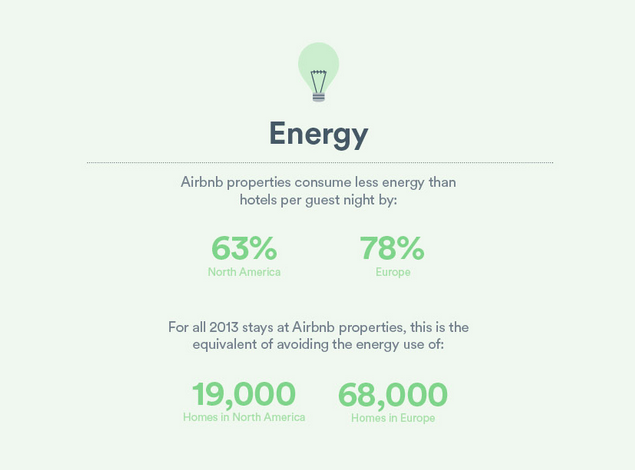 Nearly 79 percent of Airbnb hosts in Europe report owning at least one energy efficient appliance at their property. In Europe, 89 percent of Airbnb hosts say they recycle at least one item type at their property; 94 percent of guests report that they recycle when possible. When staying at an Airbnb, guests are 10-15 percent more likely to use public transportation, walk or bicycle as their primary mode of transportation than if they had stayed at a hotel.When staying at an Airbnb, guests are 10-15 percent more likely to use public transportation, walk or bicycle as their primary mode of transportation than if they had stayed at a hotel.